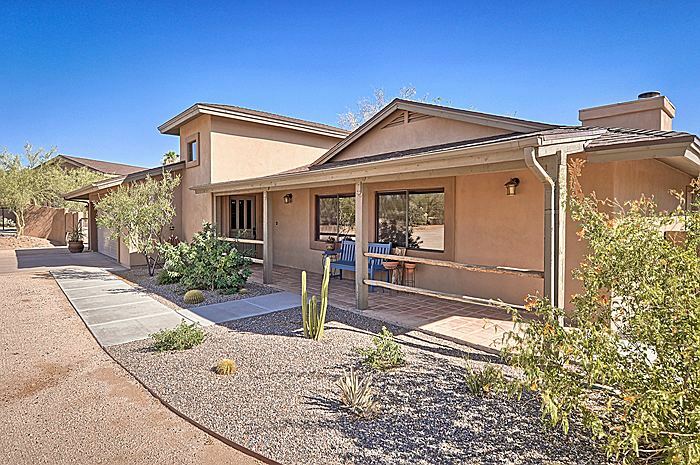 This superb north Scottsdale home, set back from the road for enhanced privacy, is located on a large horse property lot in a quiet neighborhood. The soaring ceiling in the foyer welcomes you into its versatile floor plan that features a generously-sized great room graced by a stone faced fireplace. A bay window gives expansive views from the breakfast nook adjacent to the fully equipped kitchen. French doors lead out to an over-sized and inviting patio and terrace seating area – perfect for gatherings – boasts built-in stainless steel BBQ set in a curved smooth finish outdoor kitchen prep area and its tile with decorative accents counter top – nicely illuminated with overhead lighting and shaded by wood privacy screens. A 1,000 sq. ft detached insulated Premier SIPS building with 10′ high roll-up door that can be a garage, barn, warehouse, vehicle storage for up to 6 cars, or an RV, and is also perfect for use as a large work shop for carpentry, cabinet making or anything else requiring a sturdy slab and building. The great backyard is big enough for a pool, and features horse facilities that include a fenced arena, 2 large covered stalls with auto watering, 2 turn outs, a wash and rack and a tack shed. The building is big enough to be a first rate barn for multiple horses and could handle all your equine needs. A 200 sq. ft Arizona room not included in the square footage (currently used as an office) opens to a large private atrium that leads to the yard through a corbeled gate. The north/south exposure lot has desert landscape front and back for low water use and little maintenance. A wrought iron gate means easy horse trailer or RV access; and the extended 2 car garage has lots of space for extra vehicles, a workbench area, built-in cabinets and open shelving for all of your storage needs. Open desert undeveloped state land and its trails are only 1 lot south for unrestricted horse back riding, cycling or hiking. Refrigerator, washer and dryer included.